It seems a certain someone is well on her way to joining the resident broodies in their stubborn refusal to leave the nest (the Brahmas are well into their third month now), but I’ve got to give her credit, she’s a lot smarter about it than the others. Reepicheep appears to have figured out that if she hunkers down in the coop where I can see her, she’s just going to get herself booted outside. Having had the opportunity to raise a batch of babies last year, she’s not taking any chances, and has built herself a secret woodland hideaway. The dried ferns are the perfect camouflage for her red/blue laced feathers, and it’s amusing to watch the cat and other chickens when they happen to wander by, peering suspiciously in her general direction, unable to shake the uneasy feeling that they’re being watched. At this point, she’s still going back to the coop at night, but we’ll have to keep an eye on her. In the meantime, we’ll let her have her fun. The Easter bunny has got his work cut out for him at our house, searching for eggs has lost its appeal for us. 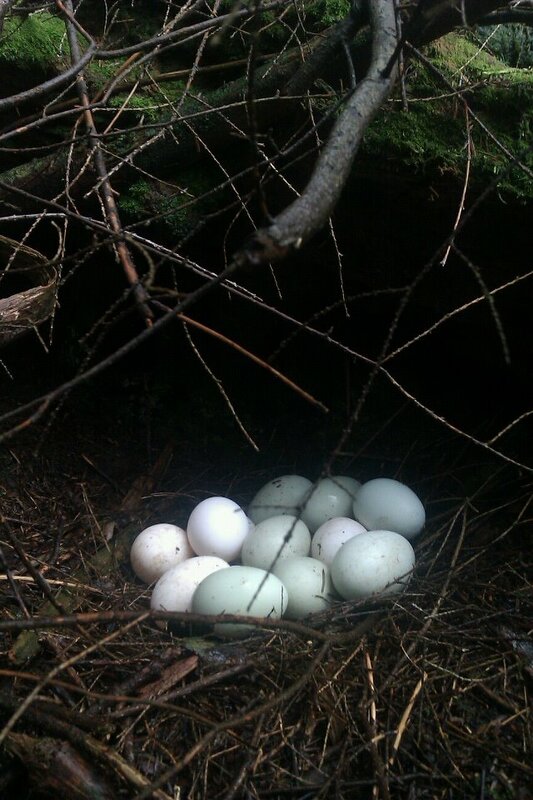 I might not like searching for eggs and wondering how old they are when I find them, but I do like seeing how clever (sneaky) these birds can be.